Well the waves are stacked up in the Pacific and due to some changes in the hemispheric long-wave pattern, they are dropping south and impacting the Sierra. With four different waves forecasted to impact the Sierra in the next 8 days, I think it's time to jump on board the Love Train! The first wave will impact the Sierra tonight and into early Sunday morning. The crest will see the most snow, with less snow the further east you head (as usual). So we are forecasting 12-18" along the crest and on the west shore, with less snow further east for areas like Northstar, Mt. Rose, and Heavenly (6-12"). We also wouldn't be surprised if some of the highest elevations near the crest see 24" of snow by Sunday morning (Figure 1). Figure 1: 24-hour precipitation forecast totals valid tonight through Saturday night. Figure 2: Mid-level vorticity (measure of spin and instability in atmosphere), winds, and heights. X's and color-shaded areas represent shortwaves/storms. Stacked up across northern Canada and all through the Pacific. Overall the pattern has shifted in the past week. Ridging and a blocking pattern has developed over the eastern United States, which has helped create more meriodinal (N-S, S-N) flow over the western United States. This has allowed that 'backdoor' cold air to slide south out of NW Canada as we have seen in our previous winter storms this year. Additionally, a ridge has developed further west in the northern Pacific than it normally has this winter, and is not quite as strong as it has been. This has allowed an active Pacific to move troughs up and over the ridge and back down south to the California coast with some help of the cold Canadian air (Figure 2). The first wave will move through tomorrow, but good moisture advection with southwest flow ahead of the trough will start producing precipitation this evening and overnight (Figure 3). There is a better moisture connection with this storm than the previous one and the moisture connection will be better than the two waves early next week. Figure 4: 5-day forecasted precipitation totals. 2-5" expected in the Sierra by Wednesday morning. Overall, we are looking at 1-3" of precipitation from tonight to Sunday morning (Figure 1). However, some of the higher precipitation totals will be at lower elevations. The snow level will begin around 7000' and drop tomorrow to around 5000' by tomorrow afternoon. We will have a break in the snow late Sunday morning through Monday afternoon before the snow starts up again. 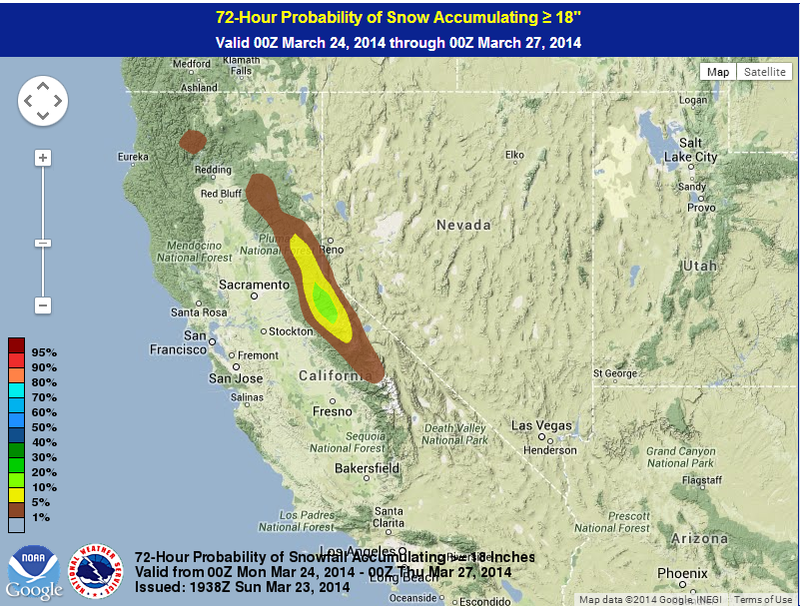 There will be two shortwaves the impact the Sierra Monday night and again Tuesday night. As of now, we are forecasting 4-8" for the first wave (Monday PM - Tuesday AM) and 3-6" for the second wave (Tuesday PM - Wednesday AM). So by Wednesday morning we should have another 7-14" of snow. It should be some fun riding over the next week with the wave train coming through, albeit a late wave train. So enjoy it while its here and stop wishing it didn't come 2 months ago! We will get some nice winter riding in and this will extend our spring skiing further into April. Ride the train!!! One more day of spring before winter's icy grip returns to the Sierra Tuesday afternoon. Confidence continues to increase in a moderate snow event for the Sierra focused on the Tahoe Basin, a rare and welcome occurrence this season. Unseasonably cold air associated with this system will provide more snow and less rain with snow levels crashing to Lake level before the bulk of the precip arrives. Current thinking is still on track with 18-24" along the crest, 12-15" mid-mountain and 4-8" at Lake level. The Hydrometeorological Prediction Center (HPC) is giving it a 20% chance for 18 inches of snow along the crest through Wednesday at 1700 PDT. An impressive cold front will move over the Sierra Tuesday afternoon/evening with some snow beginning for the highest elevations at that time. Depending on the model, snow will either continue through the overnight or take some time to become widespread. Either way, the best dynamics look to move into the area Wednesday morning as the left exit region of a 125+ kt cyclonically curved jet moves overhead. The left exit region is notorious for producing copious amounts of precipitation due to enhanced lift through a deep layer of the atmosphere. Simultaneously, the cyclonic, or counter clockwise, curvature of the jet provides favorable vorticity, or spin, further intensifying the lift. For those of you physicist out there, just think about the "Right Hand Rule." For everyone else, more spin equals more lift and that means the snow piles up deeper and faster. With the dynamics in place, the real question is: "What about the moisture?" That is where the bulk of the uncertainty remains among the models. Luckily for us, the models continue to trend towards the wetter GFS model. The folks at HPC are beginning to buy into that trend and have ramped up their precipitation forecast for the Sierra. HPC precipitation forecast for through Friday at 1700 PDT with 2.8 to 1.5 inches along the Sierra Crest. The bulk of the storm will come to an end late Wednesday night /early Thursday morning but not before it leaves a fresh blanket of surprisingly light Marchmellow fluff. Lingering moisture and instability will combine to produce scattered snow showers through the afternoon with maybe an inch or two of additional accumulation for a few lucky spots. Another forecast will be issued on Tuesday before the system is slated to arrive. Hopefully models continue to trend wetter with this system and we get in on a little March Madness of our own. As suspected, the eastward progression of this event has slowed. In addition, the main dynamics for this storm stay a bit further north than anticipated. 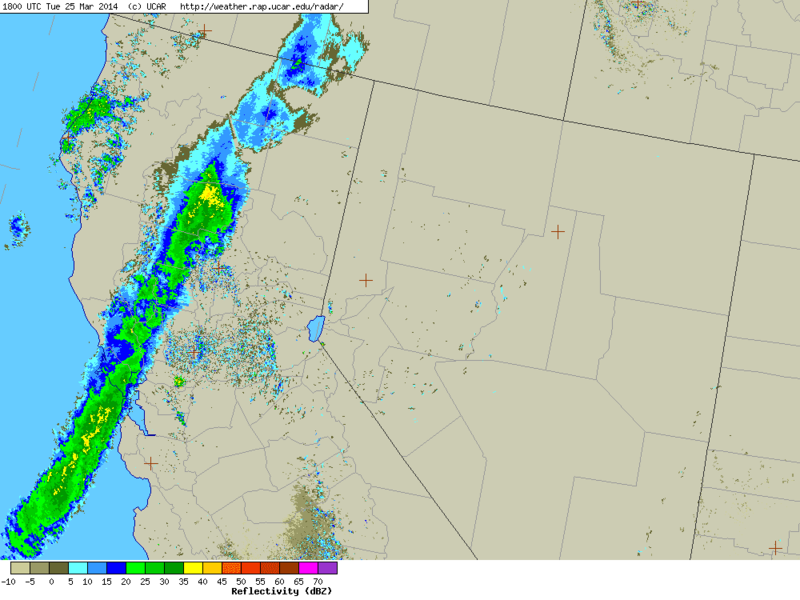 Isolated light rain (snow) showers will arrive overnight for below (above) 8,000 ft. Snow amounts will be reduced as well with 1-3" possible below 7,500 ft; 3-6" above 8,000 ft. Winds will crank up in advance this afternoon and overnight from WSW. The best timing for a short burst of Pow, above 8,000 ft, will be just before and during cold fropa which drives through Monday late morning. Monday afternoon will be breezy and cold above 8,000 ft, wind shifting from WSW to N, with isolated snow showers likely. If you dress warm, Tuesday has potential at high elevation; blue early and isolated snow showers later, but the N wind will bite. This weekend takes a split weather wise with a bluebird Saturday, at least early on, and a grey day Sunday as light rain (snow) showers commence below (above) 8,000 ft in advance of more significant moisture Sunday night into Monday. The subtropical feed associated with this event will keep snow levels above 8,000 ft until late Sunday. Snow levels will drop to Lake level on Monday as cold fropa passes through. At this time, snow amounts look to be limited due to the wetter/warmer nature of this storm with totals on the order 1-3" below 7,000 ft; 3-6" between 7,000-8000 ft; and 6-12" above 8,000 ft.
Over time, forecast models continue to show a slower progression for this storm. The momentum slowdown appears hinged to the developing nature of the upper-level flow where the upper-level ridge building in overnight through Saturday positively amplifies across the Great Basin in conjunction with a downstream shortwave that digs back across western Texas / eastern New Mexico (see Figure 1). The net effect of this ridge-trough sequence facilitates the behavior of the upstream trough that we await for Sunday. The orientation (the positive tilt) of the latter then reveals a subtropical fetch along the central California coast Sunday into Monday (see Figure 2). progression and sets up the subtropical fetch depicted in Figure 2. Figure 2 depicting the subtropical fetch (precipitable water) spreading into northern-central California. Because the models continue to change the progression of this event, a short update will be issued early Sunday incorporating new details. In the meantime, get out early on Saturday and enjoy bluebird conditions. Well the pattern as promised has stayed active, and it looks like those storms are and will impact the Sierra this week. The first storm is occurring today/tonight, and the second one will hit late Wednesday and into Thursday. Neither storm will drop that much snow and snow levels will be high, but a couple of small refreshers are always welcome. Expect 3-6" of snow above 7000' by tomorrow morning with highest totals closer to the crest. For Thursday, the snow levels will be higher closer to 8000', but will fall during the latter half of the storm. The snowfall totals for this storm are tougher to forecast, but for now we are forecasting at least 3-6" above 8000'. Confidence in the 2nd storm's forecast is moderate right now. 24-hour forecasted precipitation via CEFA-CANSAC WRF. Forecasted precipitation for the Sierra and around Tahoe is 0.25-1"
Two shortwaves are passing just to our north this week, which means a few things: 1) snow, but not a lot; 2) wind; and 3) higher snow levels. The models have been bouncing back and forth for the last few days with these storms so getting a handle on them has been difficult. Some model runs have pushed the storms to our north, and some have pushed them a little further south. Either way, we knew if the storms were going to affect the Sierra and Tahoe, that we would be on the southern half of the storms. Both storms will have a good subtropical moisture connection, which will provide ample moisture, but also keep the snow levels elevated. Mid-level heights, temperatures, and winds for today/tonight's storm. A weak shortwave will mean higher snow levels and weaker lifting which means most of the precipitation will come from orographic lifting. So we have two mini-storms to look forward to so if you can take a couple of mornings off this week (probably tomorrow and Thursday/Friday) go out and enjoy some turns. The second storm will be windy so lift slowdowns/closures are possible Wednesday and Thursday.